Our range of services include epson workforce printer - pro wf-r5691 and work force pro wf-c869r network multifunction color printer. The Epson RIPS super high-yield ink supply units can print up to 50,000 pages before an ink change. So, no more toners, no more cartridges, and no more unnecessary wastage or unforeseen operational issues. An affordable, A3 multifunction printer to maximize workgroup productivity. The WorkForce Pro WF-C869R A3 multifunction printer, powered by PrecisionCore®, offers the lowest-cost color printing in its class1. Its Replaceable Ink Pack System delivers up to 84,000 ISO pages before changing the ink packs2, which means fewer interventions and less hassle for you. It speeds through professional-quality prints at 24 ISO ppm (black/color)†, and scans up to 25 pages per minute3. With 13" x 19" printing, a 1,830-sheet total paper capacity4, and convenient auto duplexing, the WF-C869R has the versatility busy workgroups need. Plus, with Epson® Open Platform, it enables seamless integration with web-based enterprise applications such as PaperCut MF and other workflows. 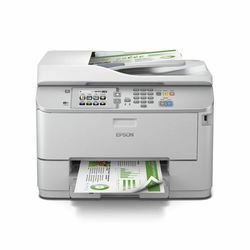 The printer is designed for use with Epson ink packs only, not third-party ink systems.